(CN) – U.S. Interior Secretary Ryan Zinke told an audience of oil and gas industry executives Tuesday that it’s the job of the federal government to partner with them, a remark that drew the ire of environmentalists. Speaking at a major oil and gas conference in Houston, Zinke talked about the Trump administration’s efforts to promote oil and gas development on public lands by reducing regulations and streamlining the permitting process. Zinke’s latest overture to the oil and gas industry prompted more rage from environmentalists who say the Trump administration and the Department of Interior are far too cozy with an industry many see as responsible for the exacerbation of climate change and pollution. “The Department of the Interior is tasked with protecting our public lands and waters for the public good, not easing the way for corporate polluters to drill, frack, and mine them for their own profits,” said Lena Moffitt of the Sierra Club in a statement Tuesday. But Zinke said the permitting process is unnecessarily onerous for investors who front significant sums without knowing whether or not they will get a return on that investment. Zinke’s comments were well received by the audience, comprised of leaders of oil and gas companies along with dignitaries from several oil-producing nations. President Donald Trump has repeatedly criticized permitting processes imposed by the federal government, saying whether the ultimate answer is yes or no isn’t as important as giving potential investors expediency and a degree of predictability. The Sierra Club and other environmentalists say the Trump administration’s true aim is to help private industry turn a profit at the expense of the environment, the outdoor recreation industry and the millions of Americans who use public lands as their backyards and playgrounds. 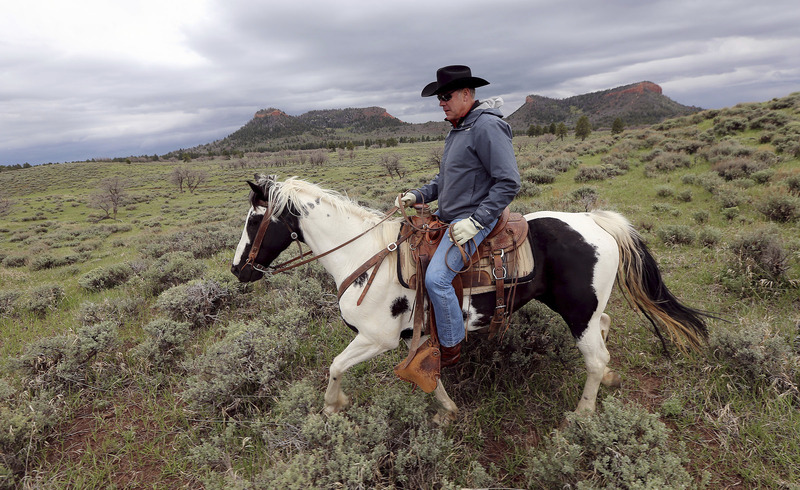 While Zinke said shrinking two large monuments in Utah was more about local control and state’s rights, The New York Times obtained documents showing U.S. Senator Orrin Hatch, R-Utah, requested the reduction of Bears Ears National Monument to uncover lands with potentially significant oil and gas deposits. Zinke also said his agency is formally considering opening the outer continental shelf to oil and gas drilling, a proposal vehemently opposed by many coastal states that say their tourism industries could be shattered by large-scale oil spills. The move has also drawn criticism from environmentalists. ZInke defended the move on Tuesday, saying he would consider the input of all states. “You can’t bring energy ashore unless you go through state water,” he said. While Zinke acknowledged the carbon problem of fossil fuels, he said solar and wind are imperfect solutions with utility-scale solar bringing land-use issues and wind turbines killing large amounts of birds.